While Ireland was living through the most severe economic collapse of its history since independence, a group of pioneering people were sowing the seeds of a new society through founding the ecovillage of Cloughjordan. Seeking to model sustainable living for the 21st century, the ecovillagers conceived their project during the boom years of Ireland’s Celtic Tiger in the late 1990s and early 2000s, but by the time the infrastructure was being laid in 2008 and the first houses built in 2009, the Irish banking and construction sectors were in freefall and the ecovillage became the country’s biggest building site. 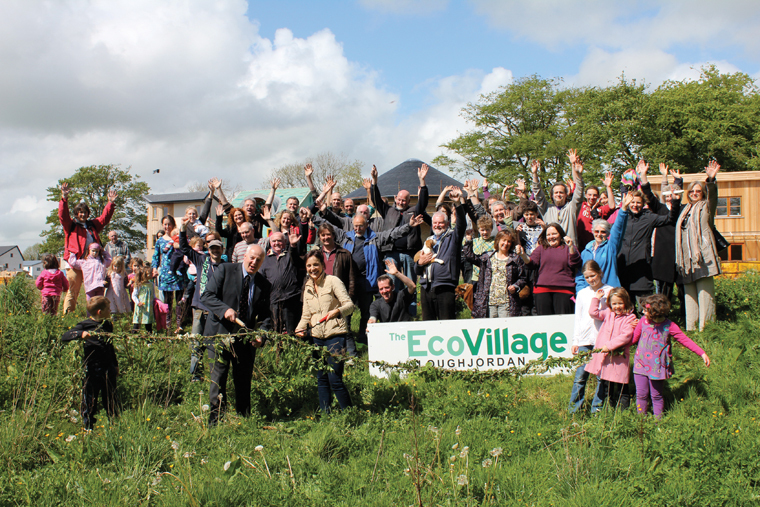 Now with 55 houses built and a population of around 100 adults and 35 children, Cloughjordan has been recognised as one of Europe’s most successful “anticipatory experiences” showing the way to a low-carbon society. As an educational charity, it draws thousands of people a year to learn the lessons of this pioneering community. Central to those lessons are the combination of some modern technologies that help lower emissions, embedded in a resilient community that seeks to foster a rich sense of interdependency, not without its tensions. Among ecovillages, Cloughjordan is unusual in that its founders decided to integrate it into an existing urban settlement. They chose the small village of Cloughjordan (around 500 people) in county Tipperary. A site of 67 acres (27 hectares) was available on the south side of its main street, on a train line, and some leading people in the local community recognised it as an opportunity for regenerating a village that was in decline. Before buying the land, members of the ecovillage project worked with children in the local schools and with the residents of Cloughjordan to win support for developing the project. Cloughjordan ecovillage therefore models not just ecological sustainability but also rural regeneration, drawing visitors to the existing village and fostering a new social, economic, and cultural dynamism. Readers of The Irish Times voted Cloughjordan one of the 10 best places to live in Ireland. The ecovillage embodies the important message that low-carbon living does not mean reverting to the privations of the past, but can be the catalyst for drawing together a diverse group of people who, through their wide range of talents, make it a lively and interesting place to live. The greenfield site that was bought behind Cloughjordan village was developed in a way unique for an Irish urban settlement. The village’s planners confined the residential area to about one-third of the site closest to the main street, while devoting a further area beyond that to support services and amenities including a district heating system, an eco-enterprise centre, allotments for growing food, and a community farm. Ecovillagers have planted native varieties of apple trees in this area; throughout the village, various varieties of herbs and fruit bushes create an “edible landscape.” An area of 12 acres (5 hectares) devoted to farming in a biodynamic way constitutes one of Ireland’s few Community Support Agriculture (CSA) projects. On the final third of the site, devoted to woodland, villagers planted 17,000 trees in 2011—mainly native species such as oak, ash, Scots pine, birch, rowan, cherry, hazel, and alder. This is regarded as an amenity area for visitors and a contribution to promoting biodiversity. A labrynth, built according to an ancient Celtic layout, provides a quiet space for reflection amid the woodland. According to the ecovillage website (www.thevillage.ie), “the community’s land use plan is based on the principles of environmental and ecological diversity, productive landscape and permaculture.” The design of common and private areas includes corridors for the movement of wildlife, and the composting of organic matter to regenerate the soil and avoiding toxic or other harmful substances is strongly recommended to all members. Since all are responsible for the upkeep of the common areas, the community organizes regular periods of communal work on the land (the Gaelic word “meitheal” is used for these, recalling the traditional practice of communal work among Irish farmers). Central to the success of the project is the combination of low-energy technologies and robust community living. The Village Ecological Charter, drawn up by members, contains the guidelines for the development of the built and natural environments so as “to reduce the impact of the project on the natural environment and so promoting sustainable development.” This includes detailed and specific targets for energy supply and use, plans for land management, water and solid waste, construction (including materials, light and air, and ventilation), and community issues such as transport, social and communal facilities, and noise and light pollution. Combining both cutting-edge technologies and some traditional technologies gives a rich and unique mix to the ecovillage. One of its most innovative features is its district heating system, the only one in Ireland powered by renewable sources of energy. This supplies all the heating and hot water for every house in the ecovillage, using no fossil fuels as primary energy sources and emitting no greenhouse gas emissions. (Electricity supply to drive the pumps and for other purposes is taken from the public mains at present, but there are plans for on-site generation in due course.) It saves an estimated 113.5 tonnes annually of carbon that would be emitted by conventional heating systems for the number of houses served. Though the ecovillage has the largest bank of solar panels in Ireland, these haven’t yet been commissioned due to faults in their installation; the district heating system relies on waste wood from a sawmill about an hour away. Members buy sites from the cooperative which owns the estate (of which all site owners must be members), building their own houses to their own designs, in keeping with the principles and specifications of the Ecological Charter. As a result, many different building types have been used, including passive timber frame with a variety of insulations and finishes, Durisol blocks (blocks of chipped wastewood bonded with ecocement), sheep’s wool, cellulose (shredded newspaper), hemp-lime (lime is a traditional Irish form of finish but the addition of hemp, a fibrous plant material, gives it strength and insulation), cob (clay, sand, and straw), a Canadian stick-frame house with double stud walls (with no cold bridging), and kit houses, while natural slates or recycled plastic roof tiles and “green roofs” are widely used. These provide a colorful variety of different designs and finishes that gives the ecovillage a very distinctive look compared to other residential areas in Ireland. It also has some of the lowest Building Energy Ratings (BER) in Ireland. The ecovillage includes Ireland’s first member-owned and -operated CSA farm. Some two thirds of ecovillage households are members and the rest come from the wider Cloughjordan community. Currently it grows 4 acres (1.6 ha) of vegetables, 1 acre (0.4 ha) of cereals, 1 acre of green manure (humus building), and 6 acres (2.43 ha) in permanent pasture. Members pay a monthly fee (around €130 for a household of typically two adults and two children) and can take what food they want from a central distribution point that is supplied three times a week, all year around. Two part-time coordinators act as the main producers, are paid from the farm budget, and are answerable to the farm board which is elected by members. They rely on WWOOFers (Worldwide Opportunities on Organic Farms) and interns as well as on the voluntary labour of members when called upon. Not only does the form of food production and distribution link the producer and consumer in a deeply interactive relationship, but it changes practices of consumption since members rely on whatever food is available according to the season, the weather, and the amounts planted. The farm also contributes to the resilience of the ecovillage itself, lessening reliance on commercial producers (often very distant), improving greatly the quality of food consumed, and enhancing skills and practices among members. It recently returned to the use of horses to plough the land to avoid the compacting that resulted from the use of tractors, and has hosted public demonstrations of horse-drawn ploughing. The farm also links in with other projects through which ecovillagers earn a livelihood, such as the award-winning Riot Rye bakery and baking school, members who turn the food produced in the farm into tasty wholesome meals for ecovillagers and visitors, and the Green Enterprise centre with Ireland’s only community-based Fab Lab (fabrication laboratory with 3-D printers). Ireland’s largest cohousing project is being developed in the ecovillage to offer low-cost accommodation to those who want to come and sample life or live in the ecovillage. All these exemplify the “ecosystem of innovation” through which synergies grow, enhancing each of the elements of ecovillage life. Beyond the technologies, both ancient and new, what is essential to the character of the ecovillage is that it is an intentional community. The dense web of interconnectedness that characterises relationships is strengthened and at times tested through a myriad of different kinds of activities, from the often tense discussions attempting to reach a community consensus on key issues to the enjoyment of community meals and parties where rich encounters take place. A special Process group exists to facilitate community interactions, and the monthly community meeting establishes a period in which any member can voice any issue that is troubling them, including issues of grievance and pain caused within the community. Successful community, then, depends not on avoiding or minimising pain and tensions but rather on facilitating their expression in an atmosphere of mutual respect. A diverse membership, which includes professional facilitators, counsellors, and psychotherapists, helps this process. Finding a governance structure that reflects its values is a particular challenge for any intentional community, particularly one as complex and multifaceted as an ecovillage. By 2007, the existing organisational structure of Cloughjordan ecovillage based on multiple committees was under strain, unable to deal effectively with the many tasks and challenges facing the project. This led members to turn for support to consultants Angela Espinosa and Jon Walker, who promote the use of the Viable Systems Model (VSM) in cooperatives and large communities looking for alternatives to traditional hierarchies. This resulted in the restructuring of the ecovillage governance structures according to the principles of VSM, identifying the primary activities (PA) of the project and establishing groups to promote them. Two PAs exist in early 2016, one on education and the other on land use. A Development PA, looking after the development of the built environment, has recently been disbanded as it wasn’t working well, and a replacement is being put in place. Each PA has a number of task groups within it responsible for different aspects of the primary activity. The PAs are known as System One groups in VSM. Supporting these are what are called the meta-systemic management functions, Systems Two to Five, each of which fulfills essential functions in the organisation. These include a Process group to oversee the smooth functioning of the whole structure and to resolve problems as they arise, and a coordination team drawing together the activities of all the various groups and providing a monthly reporting mechanism to members. System Four involves keeping a close eye on what is happening in the wider society so as to strategically relate to developments. This led to the establishment of a Navigation group. Finally, System Five involves oversight and direction of the whole project, and includes the Board of Directors and the monthly members’ meeting supplemented by an Identity group which deals with issues of membership and purpose. VSM allows a horizontal rather than a hierarchical management of the project, which ensures that bottom-up initiatives flourish while at the same time the coherence of the project as a whole holds together. The questionnaire achieved a 94 percent response rate, indicating a high level of interest. Based on the survey, an EF of 2 global hectares (gHa) was estimated for the ecovillage, the lowest recorded for an Irish settlement. This compares to an EF of 2.9 gHa for the nearby town of Ballina after a four-year campaign to reduce its footprint, 3.9 gHa for a commuter community, and 4.3 gHa for 79 settlements throughout the country. Apart from measuring the ecovillage’s EF, the results also allow the sources which constitute each of these EFs to be compared. The Global Footprint Network, an NGO which has developed and implemented the methodology for measuring EFs internationally, estimates an average EF of 4.6 gHa for Ireland (www.globalfootprintnetwork.org). It recognised the significance of Cloughjordan’s EF by including an article on it in its newsletter. Globally, it is estimated that the maximum EF for each human being that allows them to live within the planet’s biocapacity is 1.8 gHa. Based on this, ecovillage residents would currently need 1.1 planets to continue living the way they do. A plan for the systematic reduction of the ecovillage’s EF with targets and periodic measurement to establish progress is being developed in early 2016. Cloughjordan ecovillage faces many challenges. It is still only in its early phase of growth with more than 70 sites yet to sell, which will draw in new members and more than double its population. Yet already it is winning national and international recognition. Cloughjordan won the National Green Award for Ireland’s greenest community three years in a row from 2012 to 2014 and won a gold medal award at the 2013 International Awards for Liveable Communities (LivCom), also known as the Green Oscars, hosted by Xiamen in the People’s Republic of China and supported by the UN Environmental Programme (UNEP). The Milesecure consortium of 15 research centres throughout Europe was funded by the European Commission to learn the lessons for European policy of how to transition to a low-carbon future. As part of its research, it examined 1,500 projects all around Europe to identify the most successful “anticipatory experiences” to help guide EU policy. Among the 23 finally selected was Cloughjordan ecovillage and it was the only project to be highlighted in the “manifesto for human-based governance of secure and low-carbon energy transitions” that the consortium wrote as one outcome of its three-year project (see www.milesecure2050.eu). In these ways, the project is helping establish itself as a beacon for the challenging future that confronts humanity. Peadar Kirby is Professor Emeritus of International Politics and Public Policy at the University of Limerick. He is the author of many books on models of development in Ireland and Latin America. His recent books include Adapting to Climate Change: Governance Challenges, co-edited with Deiric Ó Broin (Glasnevin, 2015) and Transitioning to a Low-Carbon Society: Degrowth, austerity and wellbeing, co-edited with Ernest Garcia and Mercedes Martinez-Iglesias (Palgrave Macmillan, forthcoming in 2016). He is writing a book on pathways to a low-carbon society to be published by Palgrave Macmillan in 2017. He was one of the first residents of Cloughjordan ecovillage in 2009 and is currently chair of the Board of Directors of the ecovillage.